What happens in the studio does not stay in the studio. 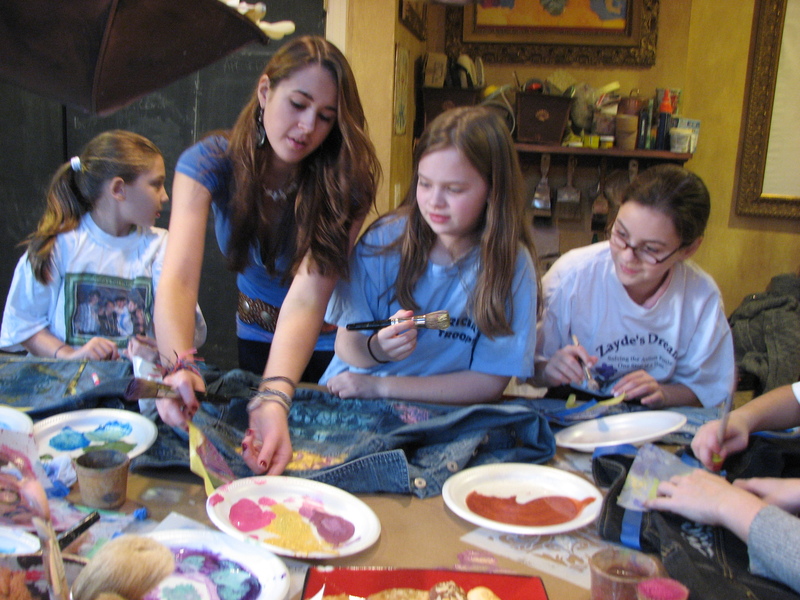 Often the art studio turns into an actvity to raise awareness for autism. Inspired by my nephew David who was diagnosed with autism at age 2, my daughter Stephanie paints denim jackets and heart shaped pins to raise awareness and funds for programs and research. 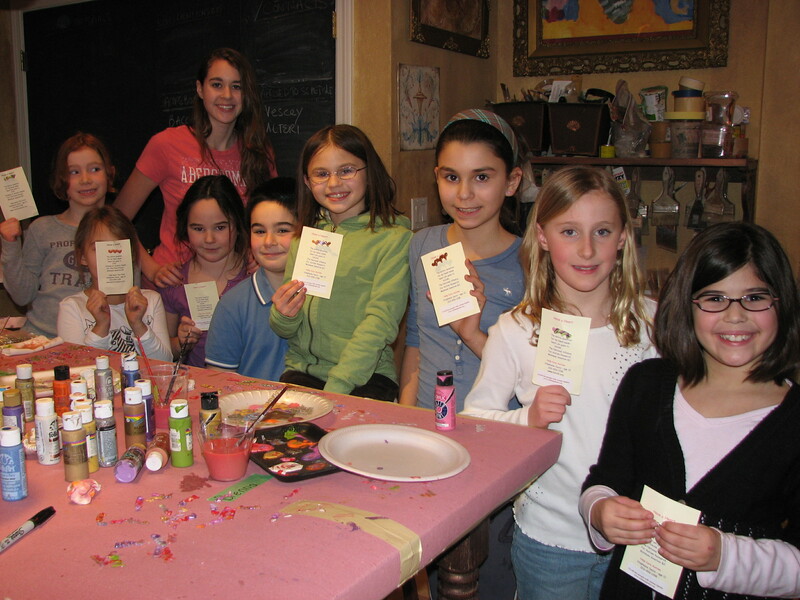 But Steph does not accomplish this alone, younger children from brownie troops, elementary and middle schools come to the art studio to take part in the fun for a cause. 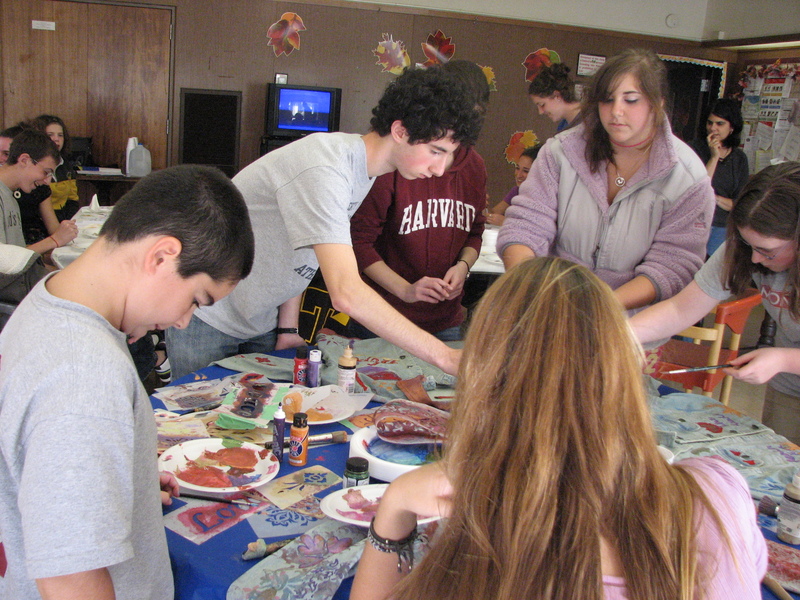 Friends are always the first to pitch in and act as roll models for the younger kids to get involved. Jackets are painted to give to auctions for various Autism organizations. The pins raise money for David’s Educational Program called FAAP, The Foundation for The Advancement of Autistic Persons ( Eden II Programs) and for FAP, Friend of Autistic People, an organization building a farm on which autistic adults can live and work. 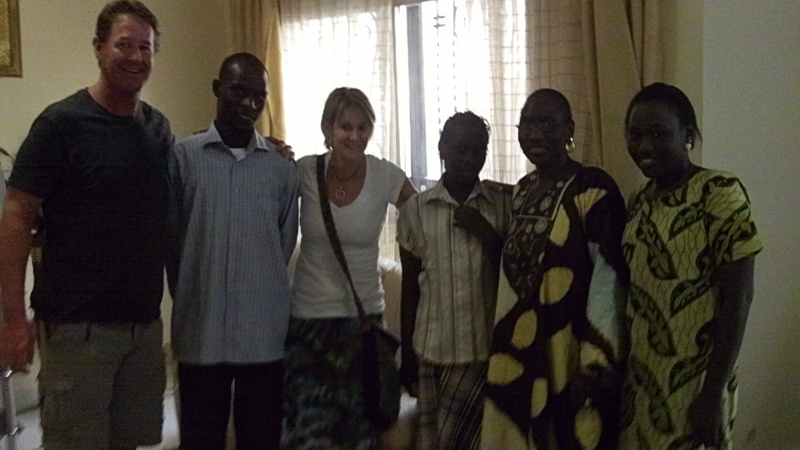 My visit to Ashoka to meet Ndeye Binta Houma was a highlight of the trip. Ashoka is an organization sponsoring individuals called “Fellows” who are social entrepreneurs recognized to have innovative solutions to social problems and the potential to change patterns across society. Ashoka Fellows work in over 60 countries around the globe in every area of human need. Nbinta and I spent time discussing Ashoka’s Fellow program, volunteerism and some of my observations of needs in Senegal. I also met her twin sister Iyantou who teaches french via Skpe and discussed the possibilty of my starting lessons. Joel even said he would practice speaking french with me! Bonne chance a moi! Then it was back to the hotel to get Joel. I can see why it was hard for him to leave but we were off for the exciting experience of meeting more family. Our friends Ndiogou and Adina Ba live here in Stamford. 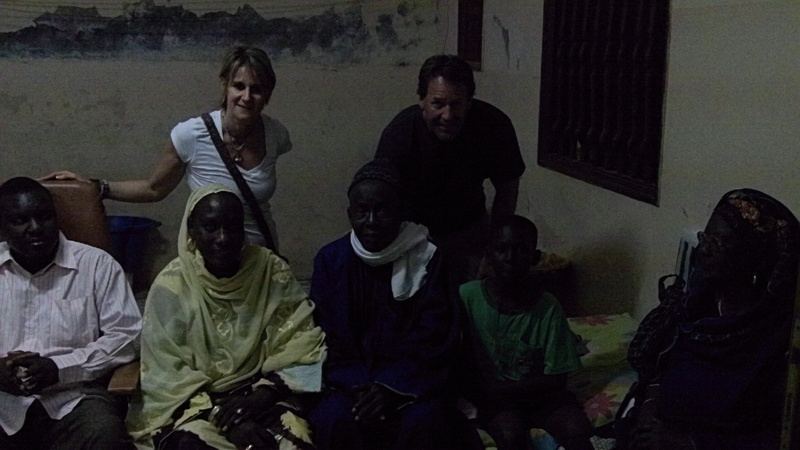 Karim took us to meet their family. We walked within the same neighborhood to three homes where we met his sister Kine, then parents, other sisters, nieces and nephews. We shared fresh oranges and mango juice and made the best possible conversation with our broken french. At each home, chairs were specially arranged for us and the entire family gathered to greet us as if we were a king and queen who had just arrived. Children of every age emerged from rooms and gathered near by to shake our hand with a greeting. we even had a tour of the home all the way to the rooftop to see the family’s sheep. I couldn’t help but reflect upon the dichotomy of our greeting customs. At home in the US the doorbell rings and someone will answer it (maybe). Children may or may not emerge depending upon if they are busy with something better, like a phone call, computer game or friend they might have over. We don’t stop what we are doing all the time but expect our guests to join in. Not so in this culture. Guests are a reason to gather and stop and respect. Some customs were the same however, as we caught Babs sneeking some food out of the frig like we would do in the home of a good friend. Now we are home and it has been a real time of reflection. So much to take in in a short period of time but I have learned so much. 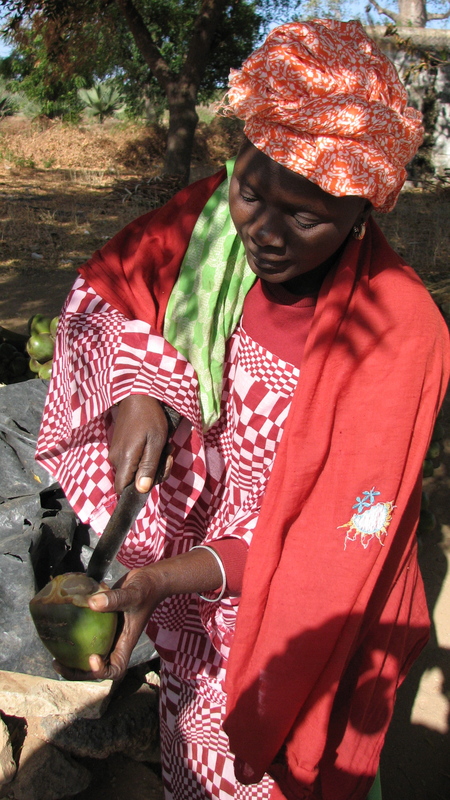 Mostly I have learned that the Muslim people of Senegal are a peaceful, caring and loving people with a sense of humor, love for music, art and history and are extremley spiritual and committed to their beliefs. I want to thank Karim and Ndiogou and Adina and their families for opening up their world to us, the beauty, respect and love that they have for their family and for others. My final message is …. travel, if at all possible. It’s the only way to truly understand others. 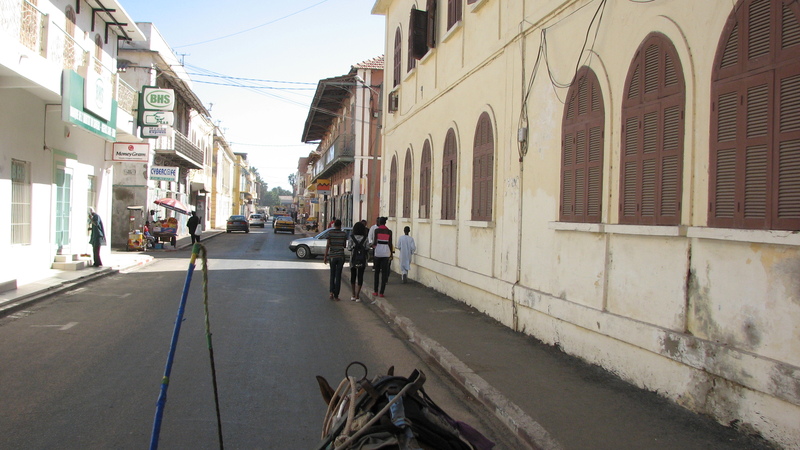 The four hour ride to the old city of St. Louis, the first french settlement in Africa and Senegal’s orginal capital gave us a taste of African countryside. 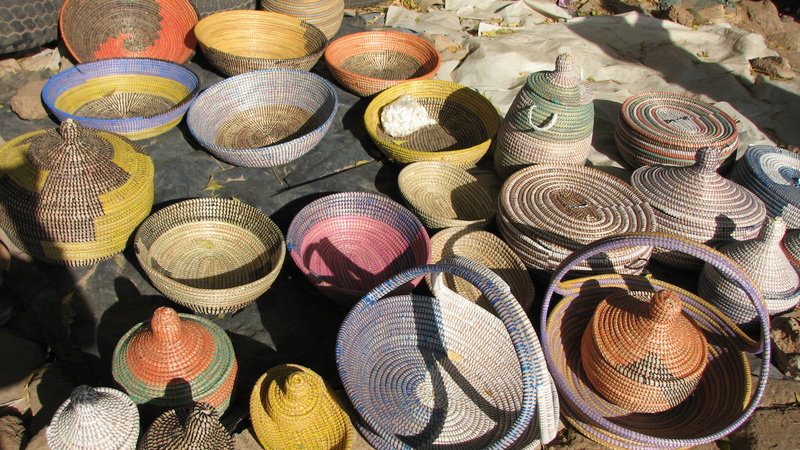 Passing through small towns we had a chance to see the local crafts and taste the juice of fruit endemic to Senegal. Arriving in St. Louis, a city surrounded by water but sheltered from the ocean by it’s sand banks, we were taken into a neighborhood with small concrete homes where Karim’s family resides. Through the fabric draped doors we were greeted warmly by Karim’s mom , sister and nieces. Karim had just married a month ago and we awaited the entrance of his bride who eventually appeared draped in veiled in beautiful white Senegalese fabric. 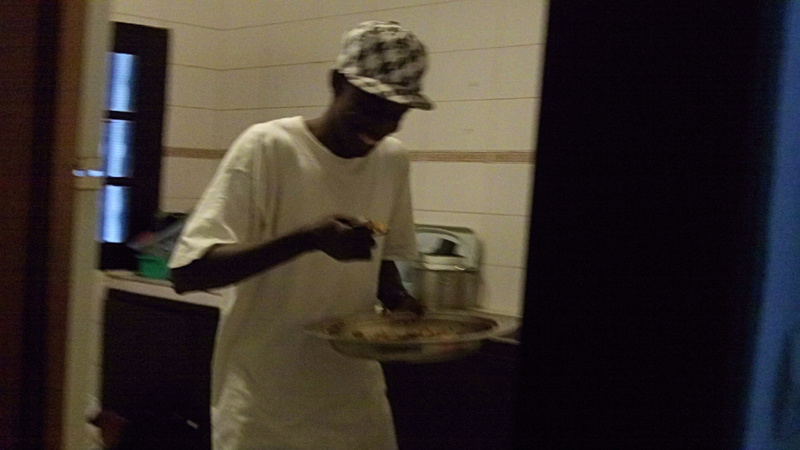 We then shared a traditional meal of Ceebu Jen prepared by the women, fresh fish and rice with a variety of vegetables. While they offered us small stools to be comfortable we insisted upon joining them cross legged on the floor …not an easy task for Joel. The meal was delicious. 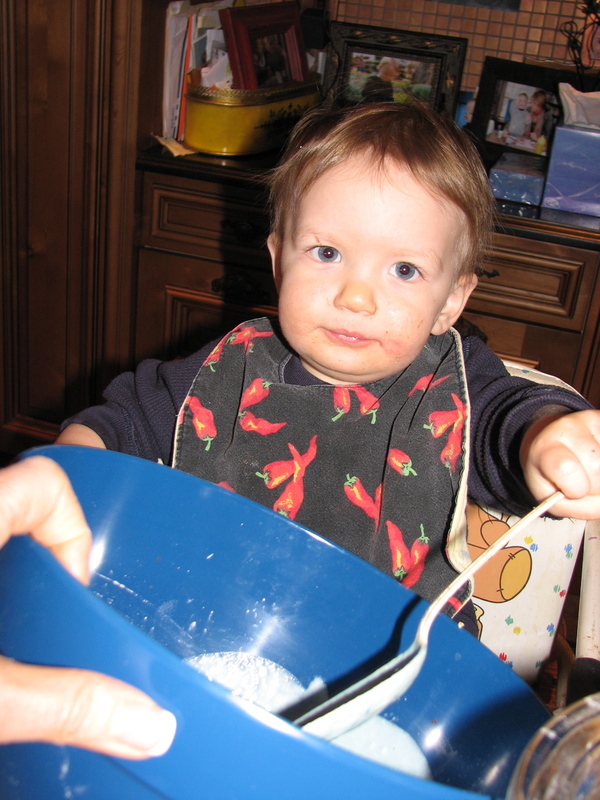 Joel especially loved the crispy rice scrapings that were presented in a seperate bowl as treat. After photos, gifts and good byes we left for the other side of St. Louis. On horse and buggy we rode through the narrow streets, markets. 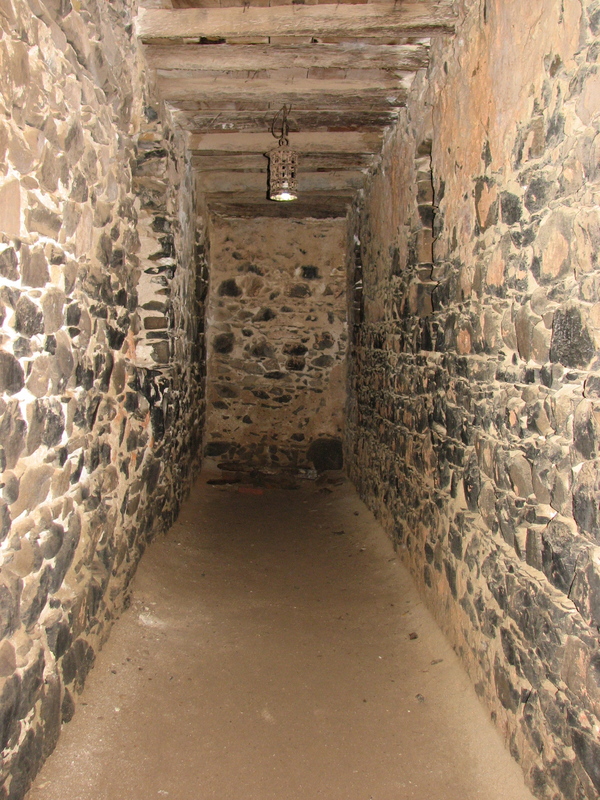 Traveling through the centuries old fishing village is not for the faint of heart. The overpopulated street swarms of young unattended children, ramshackle homes made from sticks and sheets of steel and drying fish that makes the air almost unbreathable. But as we turn the corner again we are back in the old cobblestone street planked by terracotta stucco buildings and artists crafting everything from wood furniture to shoes. St. Louise impresses a sense of the past from every step taken down it’s long narrow streets. Next was a visit into the crevices of St Louis to purchase fabric. We were disappointed not to find a small dress for our new niece Alyma in the market but little did I know that a custom dress was being made for her as we shopped and was presented by the tailor, the shopkeeper, within 5 minutes in a beautiful African fabric. A little big…but she’ll grow into it. Heading back to Dakar after an incredible day. The experience totally worth the drive. 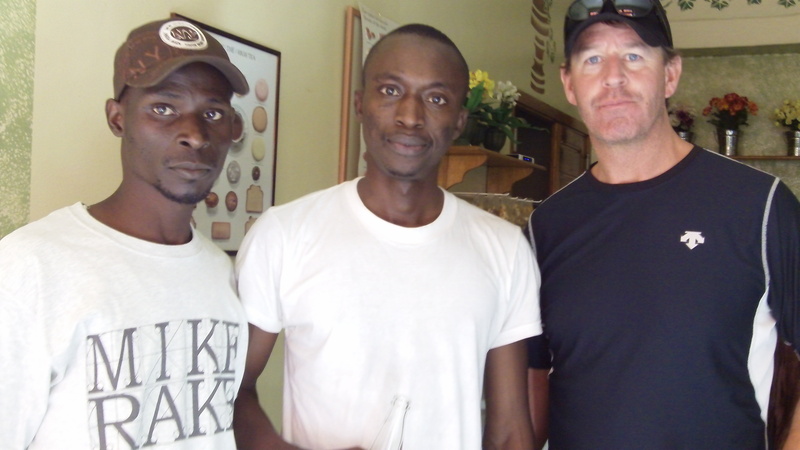 Thanks to our driver, and now friend, Babs and of course…Karim! 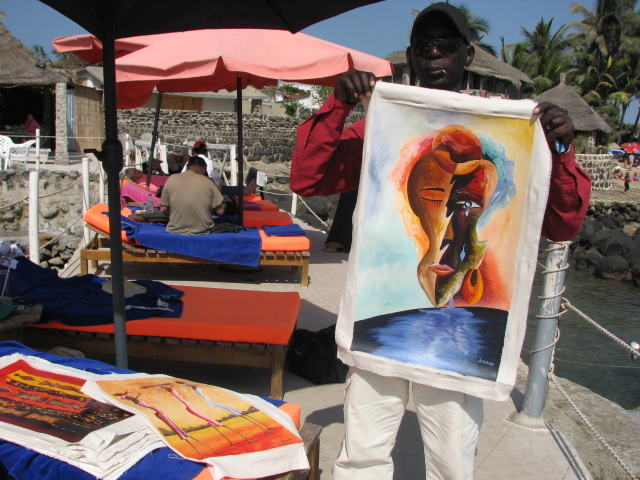 local artists at work, thatched cabanas, and delectable food. 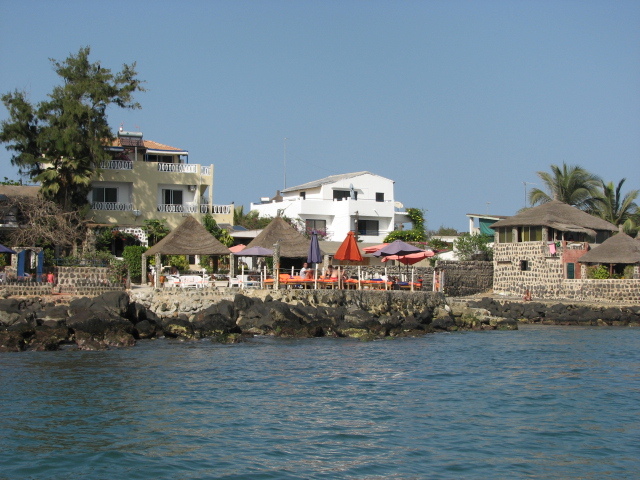 Before the arrival of French Settlers, N’Gor island was uninhabited. 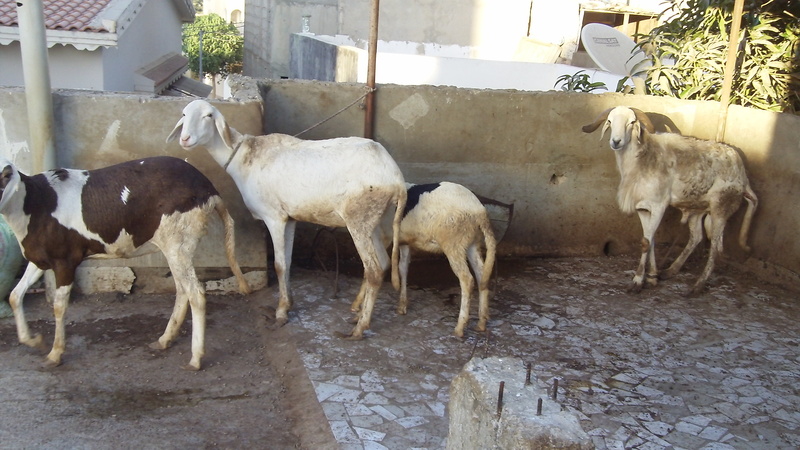 Only a few goats bred by Lebous fisherman used to dawdle on this “prohibited” territory, thought to be possessed by a bad spirit. Although few Americans visit this “treasured” Island, europeans come from all over to to vacation here. local artist, Amedine Drop’s moving painting depicts the two sides of Africa, the contrast of peace and beauty and the sadness of war. The tear drops from Sudan and the darkness represents conflicts in Congo and surrounding areas. Of course we purchased this painting with little haggling. Happy to support the local artists. 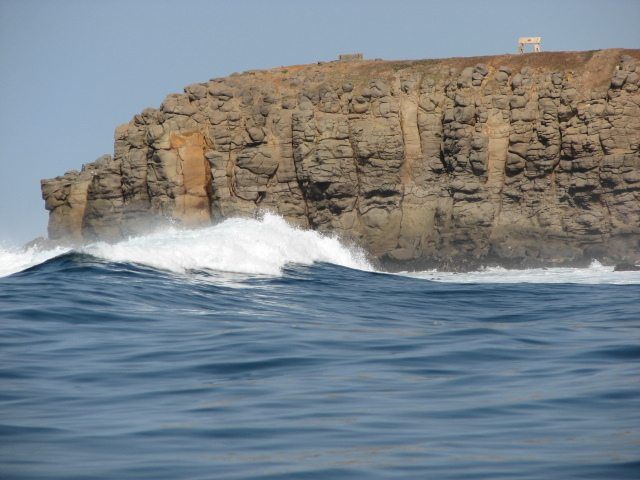 This is a favorite destination for surfers as the waves crash relentlessly against the island shore. But even with the strong sound of the ocean we were soothed by the sound of Senegalese drumming coming from somewhere amongst the rocks and trees. Walking back to the hotel locals sell everything from sesame candy to peanuts. 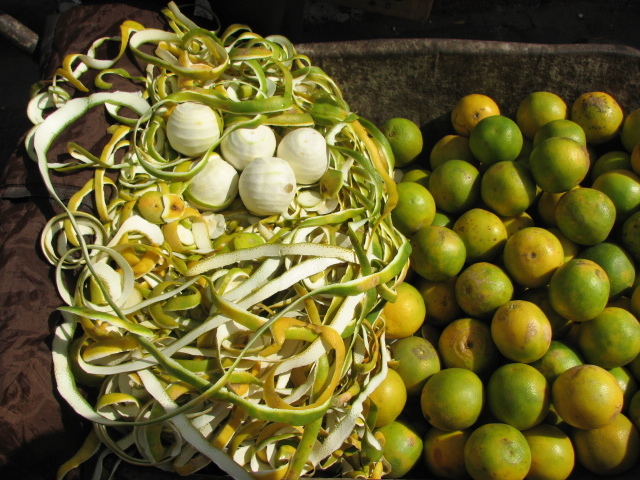 we had a sumptuous orange peeled for us like a n art. It’s sweet juice will quench any thirst. 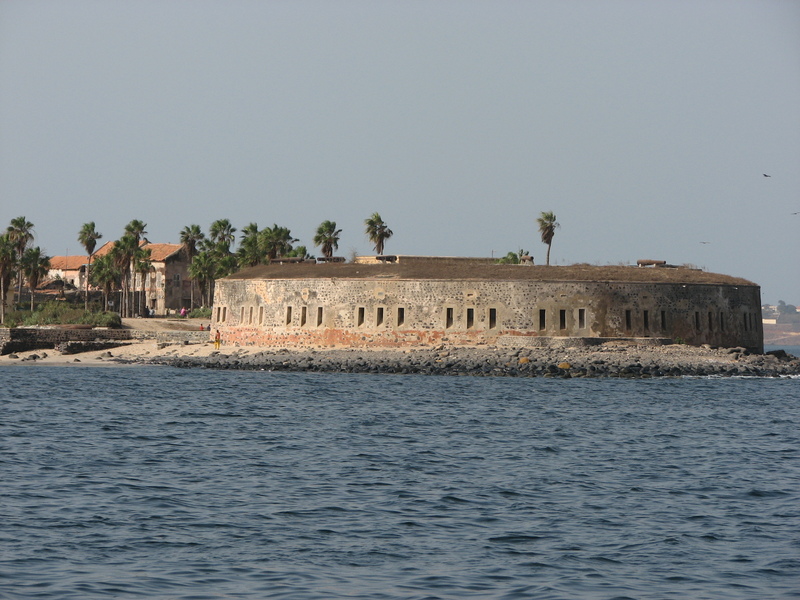 Stepping onto a small boat from Dakar, we traveled on sea for 20 minutes and entered Goree Island about three hundred years back in time. An eerie site as we approcahed the island once owned by europeans and used as a holding point for slaves before they were traded . Over 15 million Africans were brought through this one most western point of the continent over the course of 300 years to be taken into a life of servitude. forced through “the door of no return” to board ships bound for America. A life of slavery, never to return to their native land. 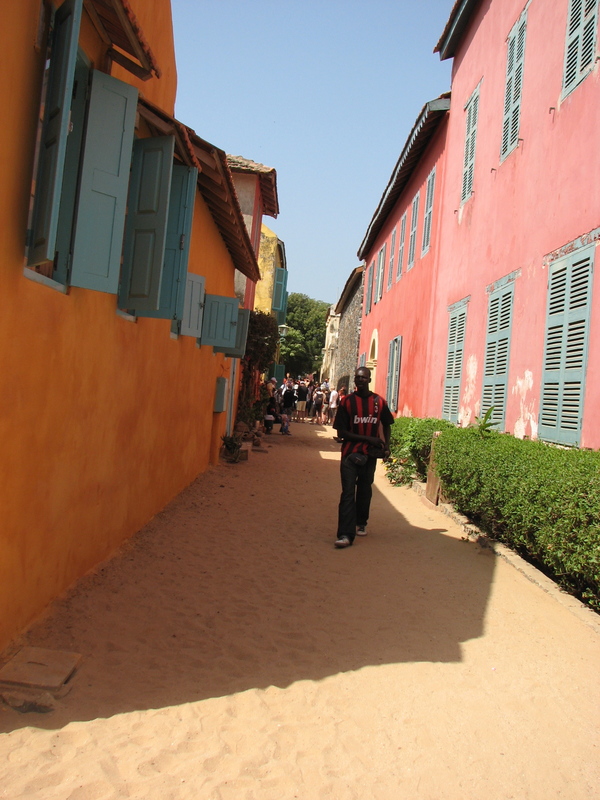 Goree Island is a beautful, colorful home of artists and fisherman but one has trouble seeing juxtapostion of the jubiliant children making a sport of catching coins off the tourists boats and the stone fortress that housed their ancestors and stole their dignity and freedom. 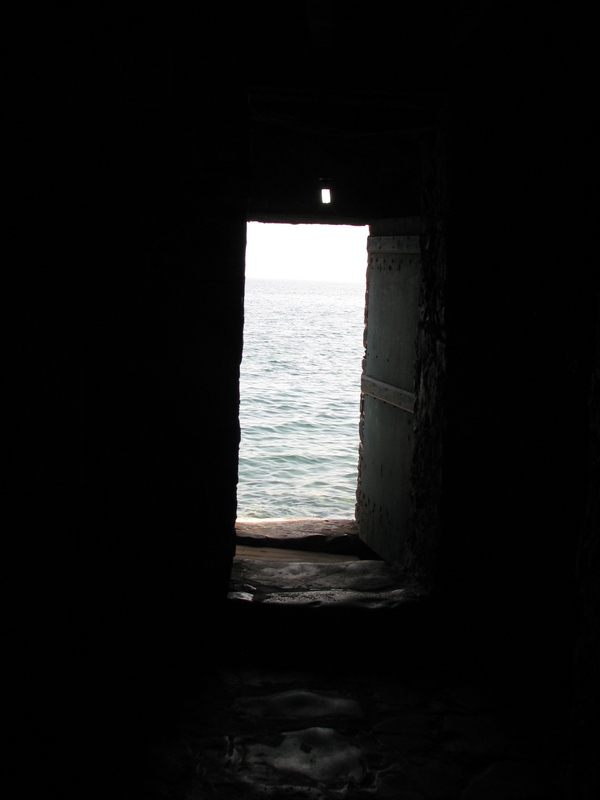 Goree Island’s Slave Museum hits you in the soul and I know it will stay with me forever. 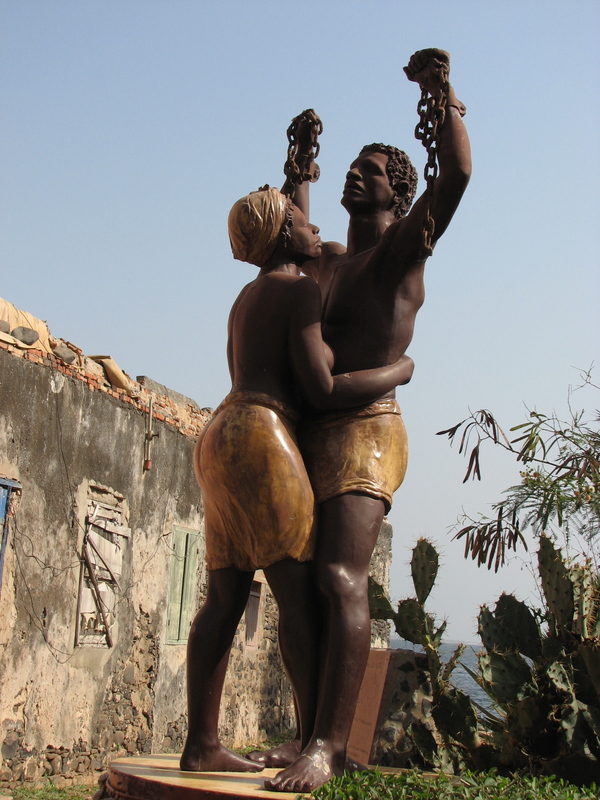 This statue of Liberty depicting a man and woman with broken chains was strong image and reminder of the perseverance of the African people. 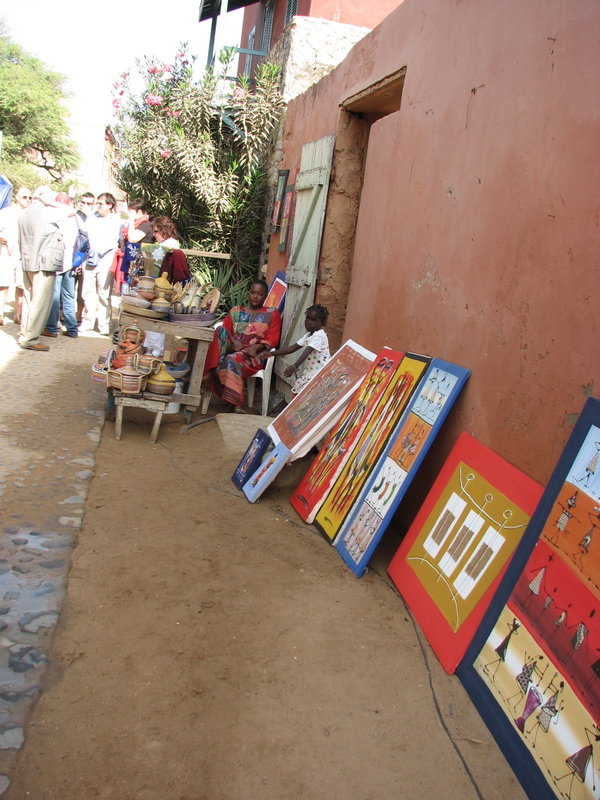 Still Goree Island was filled with wonderful surprises. A delicious meal by the sea. 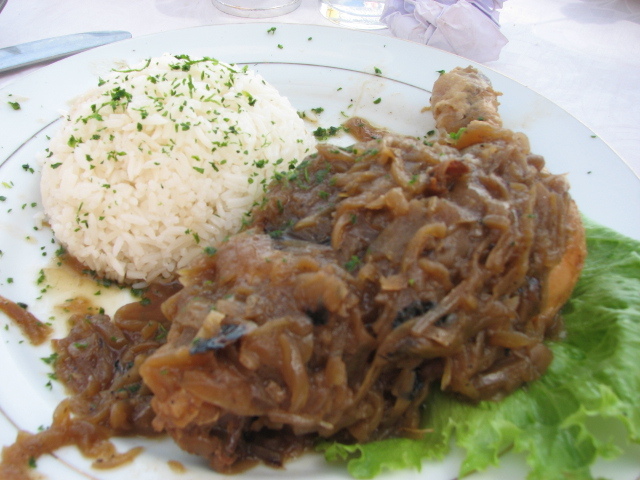 Traditional food of Poulet Yassa, a chicken and rice with delectable stewed onions. Colorful artwork and fishing boats. 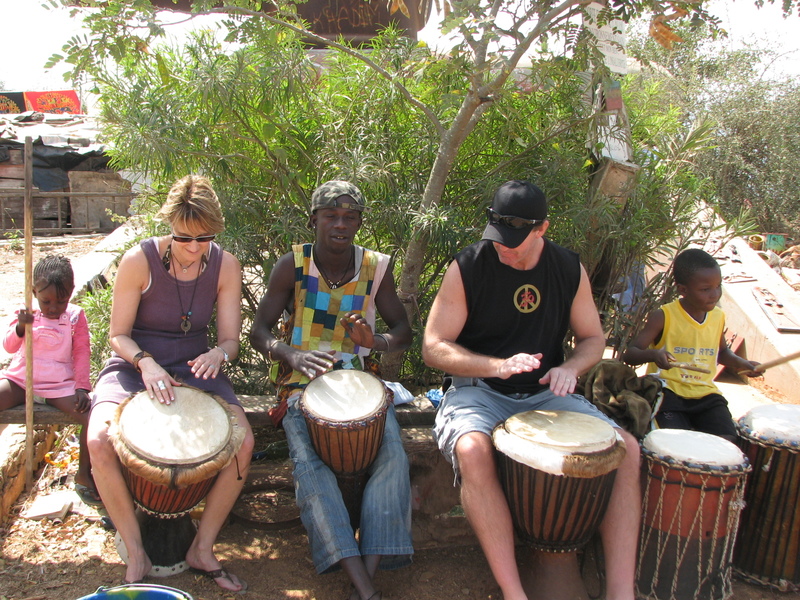 …and of course, Senegalese drummers. We had to join in but Joel got the beat much faster than I. After a full day and rest…our guide, and now good friend, Karim showed us Senegalese night life, until we turned it in at 2AM (which was when it was just beginning.) Sorry Karim. We are off on our adventure in Dakar, Senegal. After a few hours on the Tarmac in New York we made a speedy 6 1/2 hour flight overseas to Senegal. We never saw so much baggage in our lives. 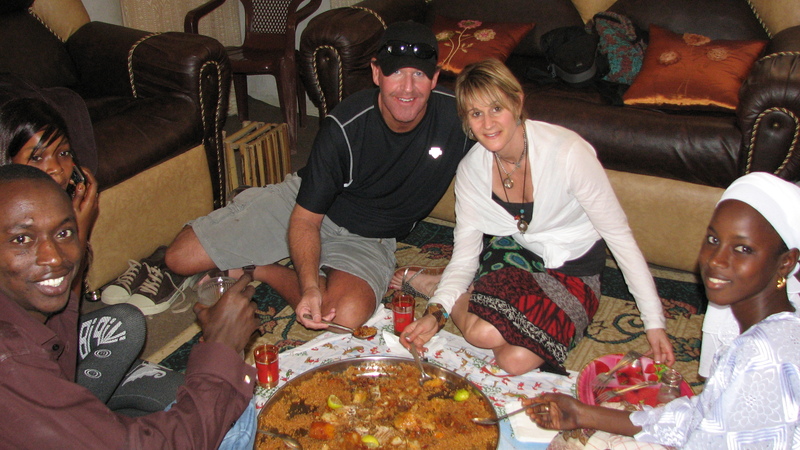 Not from us of course but from the Senegalese traveing back from NYC. What was in those bags? 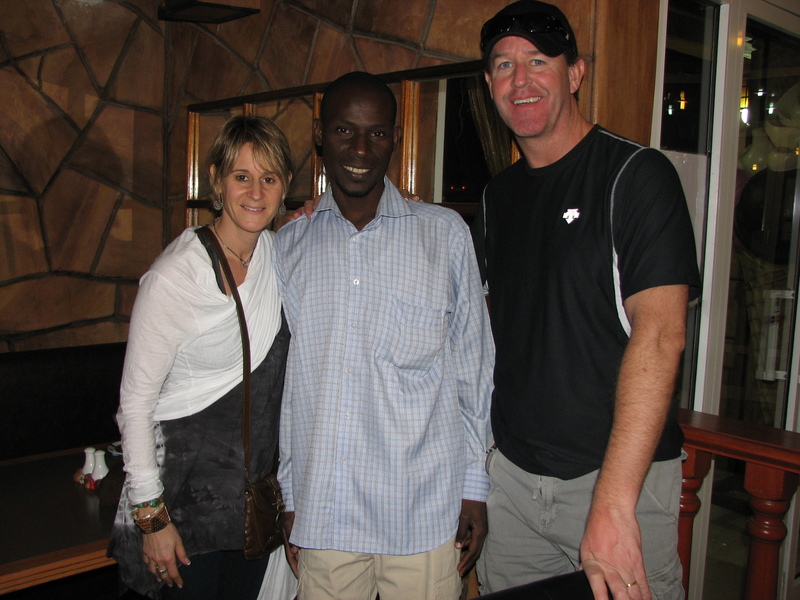 We were enthusiastically greeted by our guide Karim, who took us to our hotel to catch some much needed sleep. Our hotel is ocean front but 90% under construction. After a brief disappointment of seeing the workers carrying buckets of gravel past our window all day, we came to the realization that this wasn’t going to be a “typical” beachfront vacation and we went with it. We made our way to the beach and soaked up the magnificent climate. Full sunshine with a cool breeze. 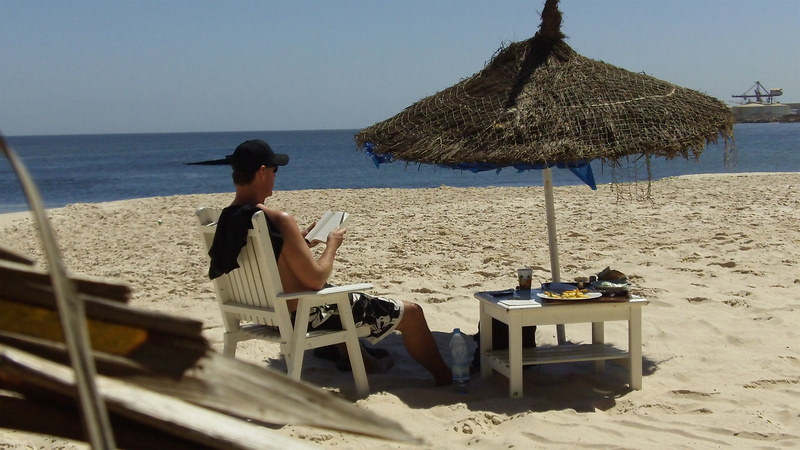 The beach experience consisted of some first day mistakes like ordering a fresh cooked fish meal that was so spicy we couldn’t eat it and paying too much for a few bracelets. But I was pretty happy with my $1 puchase of sesame candy that I consumed while reading my book. An African Football game broke out in front of us in the afternoon. Even the 2 year olds here can kick a soccer ball like a champion. Note one of the players in this picture. 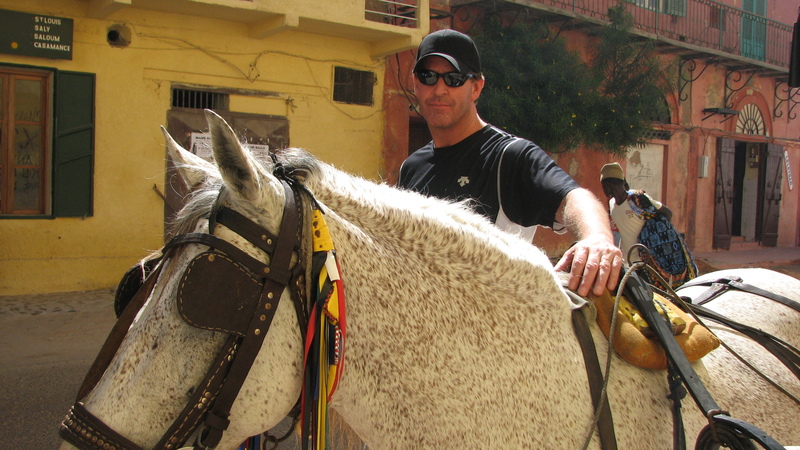 Then it was off to tour Dakar. 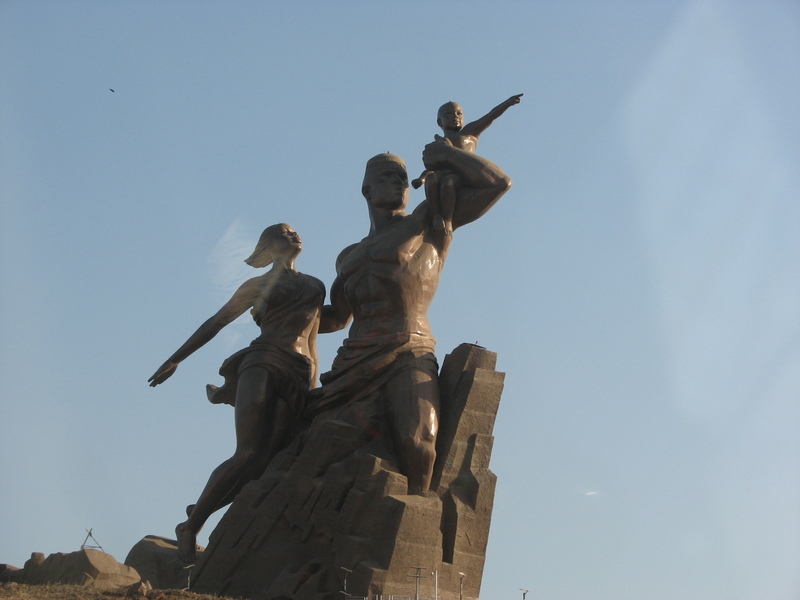 Caught a glimpse of the new African Renaissance Monument still in construction. So massive people will have to spend the day to climb it. Everything from donkeys and sheep, to vans packed with people and new jaguars crossed the street before us. The noise, confusion and constant traders approaching made it too difficult to pull out the camera in the market. So I will just consider this as a “getting our bearings day”. Thanks to Karim we did not pay too much for our Babaa Mal cd’s. Gotta catch some sleep and shake the jetlag for Goree Island tomorrow. I love working with PMC, prescious metal clay. You mold your design with a clay like product that, when fired at high heat, turns into precious metal 999 silver. I developed the HOPE necklace as a fundraising piece for Hope For Ariang. Each PMC charm with a tourquoise stone on sterling chain sells for $75. The necklace is the shape of Africa with the country Sudan etched in the metal with a small pin dot representing Ariang village where HOPE is building a school. 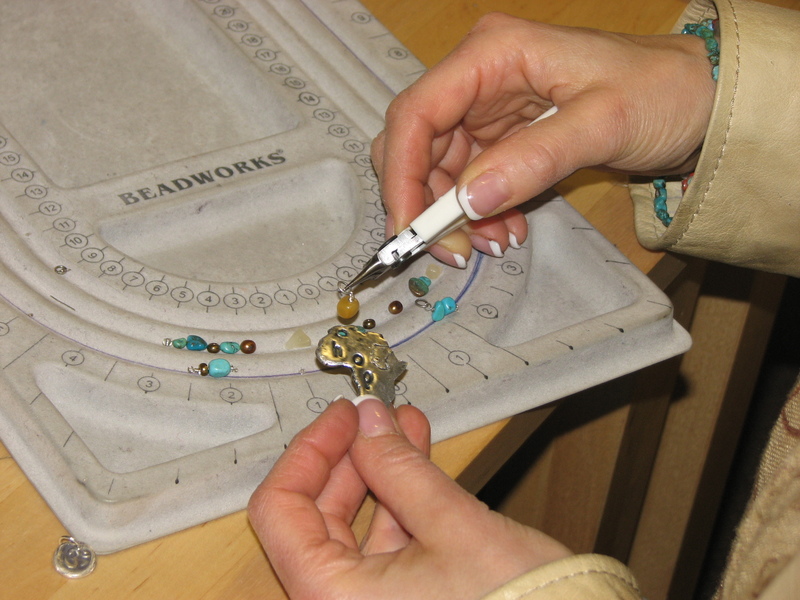 The necklace became so popular I decided to have it created by a manufacturer in Silver plate. Now it can be purchased for only $20 . Jen Marlowe, the filmmaker of Rebuilding Hope, liked it so much she put it on her film’s website. So check it out. Remember Heather from the “Flower Power” post? This is her mother-in-law. I know… she looks like her sister. 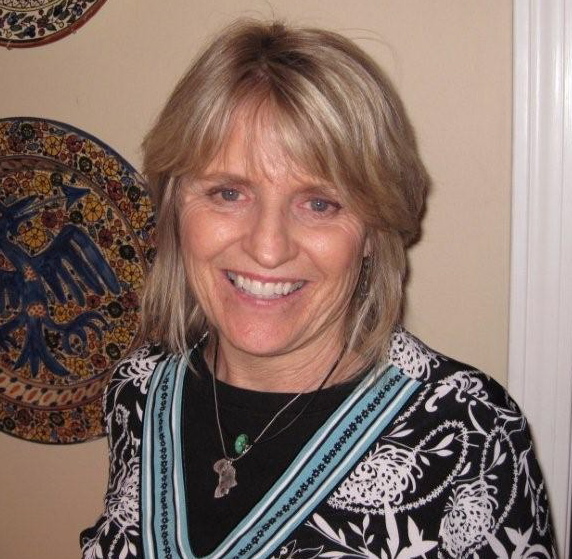 Well, she is my friend Donna and she is the true supporter of HOPE, Here she is wearing the necklace but she also buys Cereal of Hope regularly, and comes to every film and fundraising event. Thank you Donna! For those of you that have been waiting for the final touch on the embossing project. Here it is! 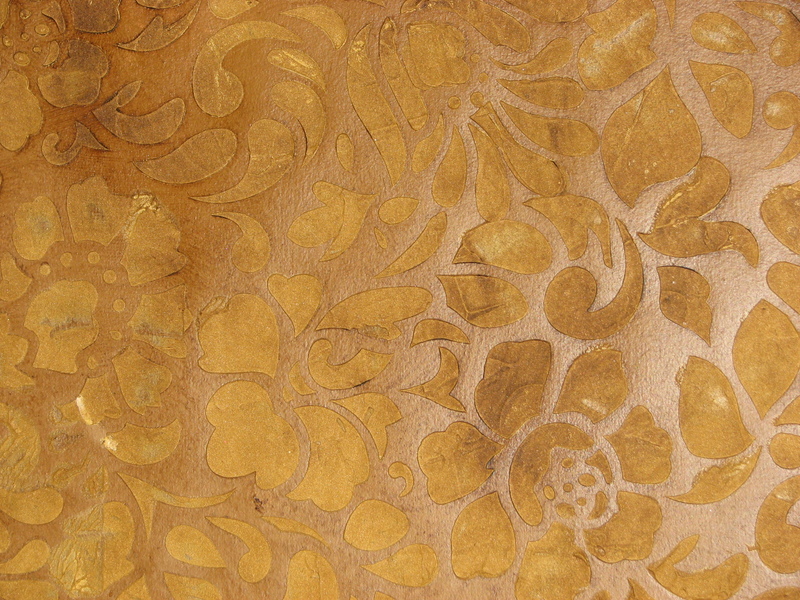 Another layer of plaster and one last stain coat and …VOILA ..Looks like leather! Hmmmmm. Where to put this on a wall????? This was a great day! I got to make homemade play dough with my adorable Godson, Gabe. heat slowly on stove mixing constantly until thick like play dough. I also mastered uploading a video to utube and a very important one! I started a challenge on my facebook wall to get everyone and their friends to post my video and send $1 to help raise money for the Ariang School in South Sudan. 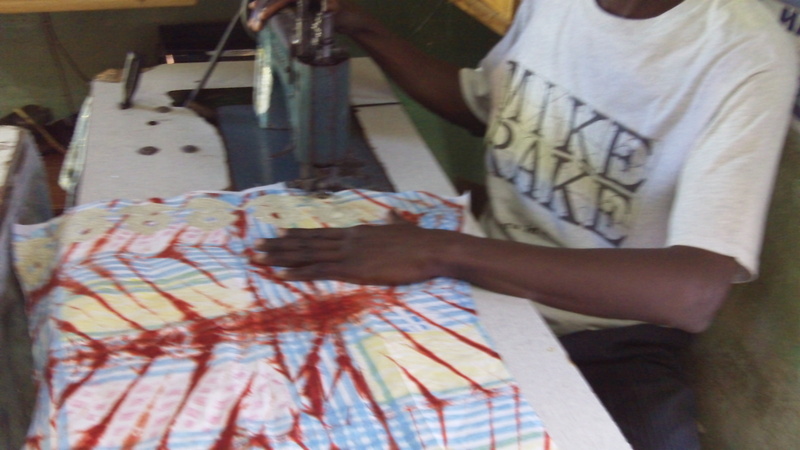 My ongoing project with the “Lost Boy” Gabriel Bol Deng. A true inspiration for my family and thousands of others. I hope you will accept the challenge. 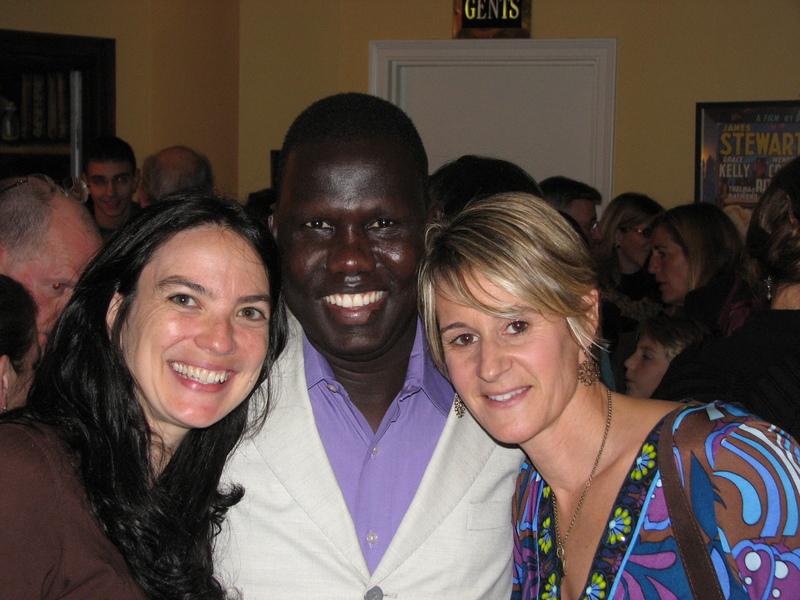 In fact, little Gabriel’s mom ( pictured above on left with Gabriel Bol Deng and me) was the very first person to give $1. Thanks Rena Paris!!! I know the two Gabe’s are very confusing. So to clarify…. there’s little Gabe (play dough) and big Gabe (building schools in Sudan). So easy to get confused!!!! 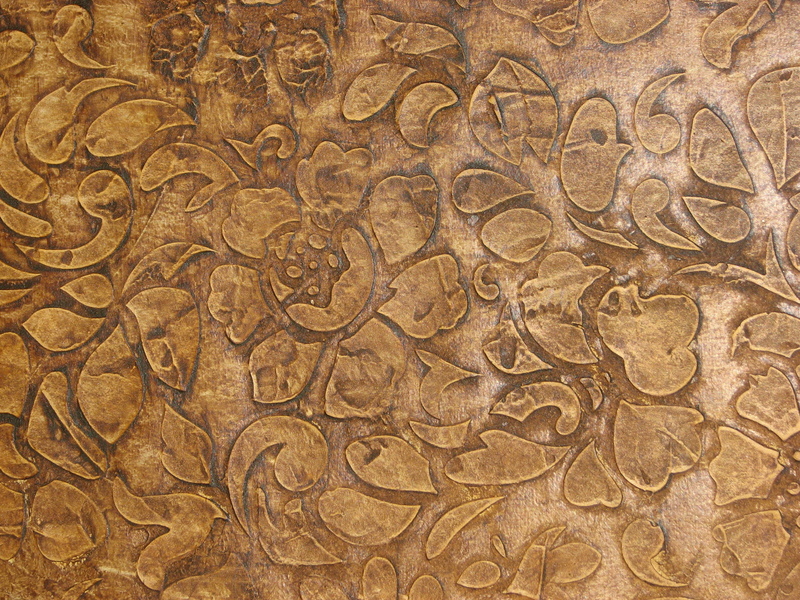 I didn’t set out to create a beautiful embossed finish, but that’s how it turned out. Sometime I get carried away with a stencil and it ends up being a “happy” mistake. 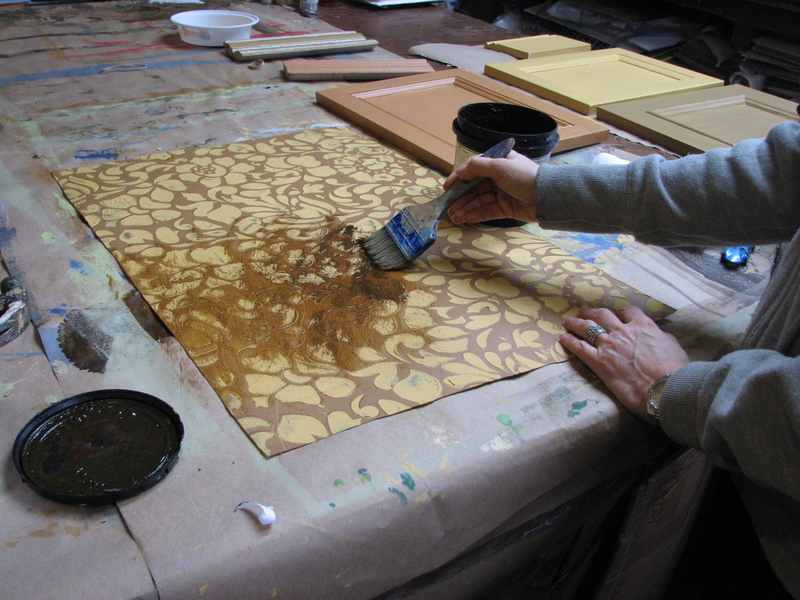 I started out painting this stencil design called summer blossom. 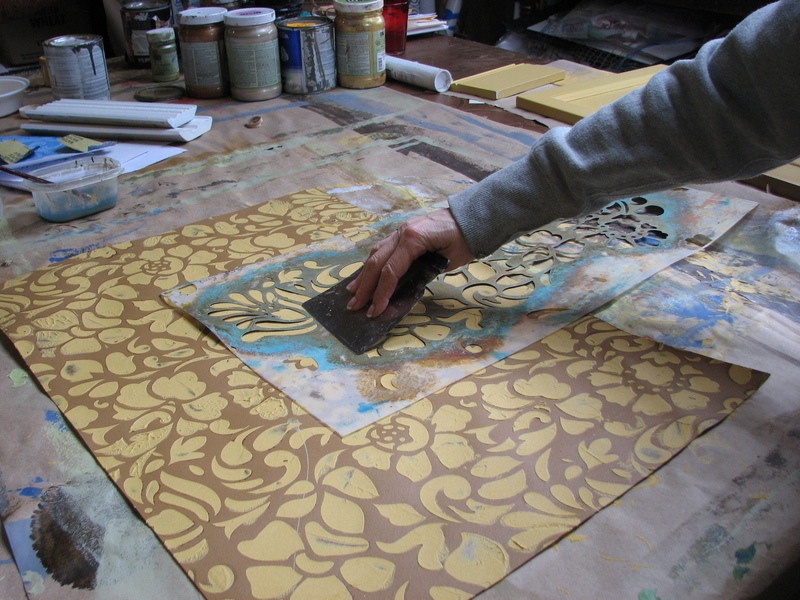 To add some texture I then troweled plaster over the painted design. Ok, That was pretty gorgeous but I couldn’t stop myself and after it dried I brushed a dark stain over that. I love the result…. but be sure to check the next post because I still think it’s asking for another layer!